Scientist raises the bar on custom-made fashion. If you've got some cash to burn and are in dire need of a new pair of shoes, here's something to check out. A company called Rayfish, operating primarily out of Thailand, now offers custom-designed sneakers made from genetically engineered stingrays. Here's how it works: Visitors to the company's website can choose from a selection of patterns, and when their order is placed, the company will then use some fancy genetic wizardry to grow a transgenic stingray with their custom design. The fish are grown in an aquaculture facility and then harvested as leather for the shoes, which are constructed at a seperate factory in Thailand. Each pair is truly unique from the other, straight down to the genetic level. 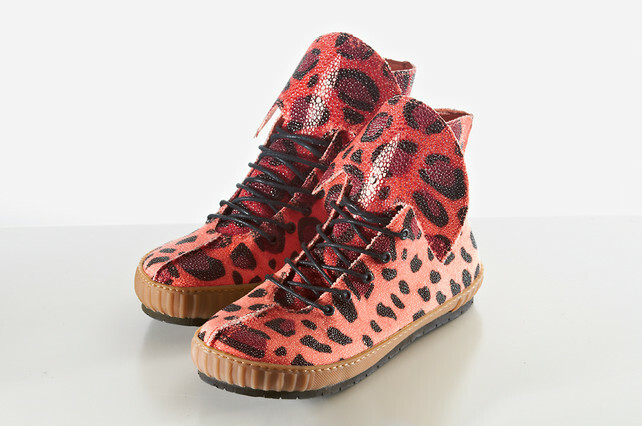 Currently, Rayfish is accepting limited orders for these shoes, which cost roughly between $14,800 and $16,200 USD. If that's just a little out of your price range right now, general production is slated to begin later this year and bring the price down to a more reasonable $1800 USD. There are also some limits to the technology, as Rayfish can't breed any shapes or logos into the fishes, as the process works through recording and recombining DNA from existing animals. "Squares are for instance not possible, as the expression of the DNA on the skin doesn't allow it," explained Dr. Raymond Ong, head of Rayfish Footwear. "The patterns that grow on the actual fish sometimes slightly differ from what you see in the design tool. Although it is almost perfect, we are still developing the mapping between the design tool and the DNA encoding further."